Across Minnesota, voter turnout surprised election officials. 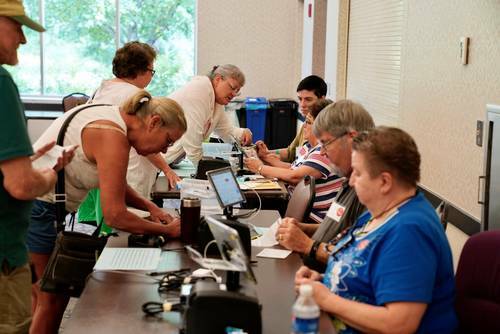 In Minneapolis, the city clerk's office says turnout by early Tuesday afternoon was already well beyond that of the last three primary elections. Voter turnout across Minnesota called "unusually high,'' making some elections officials wonder what November will bring. Important note for you last minute voters: If you're in line to vote before 8 p.m. -- even if it's 7:59 p.m -- state law says you get to cast your ballot. Know your rights as a voter! Polls close in 10 minutes in for the 2018 Minnesota primary! That's when things really get interesting. WASHINGTON (AP) — Democratic Wisconsin Sen. Tammy Baldwin is advancing to the November general election after facing no opposition from her own party. AP -- Polls have closed for primary elections in Minnesota and Wisconsin. MADISON, Wis. (AP) — Democrats tested the strength of their "blue wave" against President Trump's grip on America's white, working class Tuesday as the 2018 primary season lurched closer to an end in two Midwestern battlegrounds. At the same time, Vermont Democrats were considering whether to support the nation's first transgender major party nominee for governor, part of a so-called "rainbow wave" of extraordinarily diverse candidates up and down the ballot across the nation. Accusations of domestic violence involving the Democratic National Committee's second-in-command threatened to undermine Democratic enthusiasm, particularly in Minnesota, a state still healing from scandal. In all, four states hosted primary elections Tuesday as the primary season neared its final chapter. The first polls closed in Vermont and Connecticut, to be followed by Minnesota and Wisconsin. All but 10 states will have picked their candidates for November's general election by the time the day's votes are counted. While the full political battlefield isn't quite set, the stakes are clear: Democrats are working to topple Republican control of Congress and governors' offices across the nation. In Vermont, Democrat Christine Hallquist was working to become the nation's first transgender governor. The former chief executive of Vermont Electric Cooperative was running in a field of four Democrats. They included 14-year-old Ethan Sonneborn, who took advantage of an apparent oversight by the state founders who didn't include an age requirement for the state's top office. Hallquist would face a tough fight in November: Republican incumbent Phil Scott remains more popular with Democrats than members of his own party in the solidly liberal state. Vermont Democrats also formally nominated Sen. Bernie Sanders, who hasn't ruled out a second presidential run in 2020, for a third term in the Senate. The 76-year-old democratic socialist won the Democratic nomination, but he is expected to turn it down and run as an independent. Democrats appeared particularly motivated in Wisconsin, where eight candidates lined up for the chance to take on Republican Gov. Scott Walker, a two-term incumbent who has warned his party about the prospect of Democratic gains. Initially a Walker supporter, McGuire said he's disgusted by Walker's embrace of Trump. Walker said Monday he opposed the Harley boycott. His Democratic opponents embraced the fight. The GOP primary featured fervent Trump supporters: former Marine Kevin Nicholson, running as an outsider, and longtime state lawmaker Leah Vukmir, who is backed by House Speaker Paul Ryan. Neither candidate was an early Trump supporter, and Vukmir has struggled to explain footage recently unearthed from 2016 in which she calls Trump "offensive to everyone." Feelings about misconduct are still fresh in Minnesota, where Democratic Sen. Al Franken resigned in December after multiple allegations of unwanted sexual touching. His replacement, Democratic Sen. Tina Smith, was on Tuesday's ballot as she seeks her first full term. She's facing Democrat Richard Painter, a former George W. Bush ethics lawyer. Not to be forgotten: Connecticut held primary contests as well. Five Republicans have lined up to replace the unpopular outgoing governor, Democrat Dan Malloy. Former gubernatorial candidate Ned Lamont won the Democratic nomination. It could be a long night for results in the 8th congressional district. The Duluth News Tribune reports ballot shortages in some precincts in Hibbing and Eveleth ran out of ballots and had to switch to backup ballots. Those ballots will have to be counted by hand. U.S. Rep. Tim Walz leads state Rep. Erin Murphy 41 percent to 36 percent. Lori Swanson is down at 21 percent. And the polls are closed! By Jiwon Choi and Associated Press — Voters at the polls shared their thoughts about which way they decided to vote Tuesday. At Ravoux Hi-Rise in St. Paul, Montgomeri Baldwin brought her two-year-old grandson, Victor, with her to the polls. She said she picked women on her ballot because she said "we need more women to make some decisions." She also said that she believed the recent allegations about Congressman Keith Ellison. "I thought he was a standup guy and when you hear about things like that," Baldwin said, "if someone said that they saw videos and they have in their phone, believe it. It's in their phone and it's going to surface and it's going to be all over the place." John Feemster also cast his ballot at Ravoux Hi-Rise, and said he doesn't believe the recent allegations against Ellison. "I think it's a bunch of hearsay. There's no real proof or anything like that, at least as far as I can tell at this point and it's just hearsay as far as I'm concerned so I voted for him anyways," Feemster said. "It just sounds like dirty politics to me." 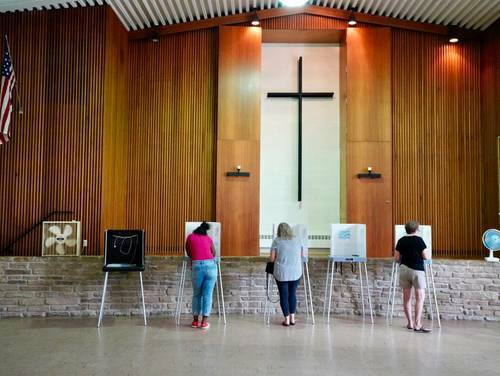 At Peace Lutheran Church in Plymouth, voter Diane Anthony weighed in on the Democratic race for governor. The 54-year-old mother of two describes herself as a moderate Democrat who always votes. Anthony cast her ballot for Attorney General Lori Swanson. She says late accusations that Swanson had pressured staffers in her office to volunteer for her campaign did not matter to her. Swanson called that accusation a lie. Republican Russel Carlson says he's a strong supporter of President Donald Trump and voted for Jeff Johnson in the Republic primary for governor. The 72-year-old retired executive says Johnson is his pick because he pledged to support Trump. Carlson says it doesn't matter that Johnson ran for governor four years ago and lost. He says Johnson's challenger, former Gov. Tim Pawlenty, has had his chance in the job and is more moderate.